Update: Charlotte Rae died on August 5, 2018 at the age of 91. She had been diagnosed with bone cancer in 2017. Nonagenarian senior citizen, and Emmy and Tony-Award nominated character actress Charlotte Rae was born Charlotte Rae Lubotsky on April 22, 1926 in Milwaukee, Wisconsin. Rae got her start in show business in radio and on stage while she was a teenager. While attending Northwestern University, Charlotte met fellow student actors and theatre lovers Cloris Leachman (Mary Tyler Moore), Patricia Neal (Hud), Paul Lynde (Bewitched), Claude Akins (B. J. and the Bear), and others that would go on to have long careers in entertainment. Charlotte changed her Russian Jewish last name of Lubotsky to Rae. After graduating from Northwestern University in June 1948, both Paul Lynde and Charlotte Rae moved to New York City to pursue careers on stage; pal Cloris Leachman was already there. Charlotte Rae married composer John Strauss in November 1951. Strauss helped with the production of her one and only album, Songs I Taught My Mother (1955). Charlotte Rae has appeared in numerous Broadway productions beginning in 1952; she originated the role of Mammy Yokum in L'il Abner (1956) alongside Tina Louise, and Julie Newmar. Rae worked steadily in New York theatre during the 1950's and 1960's, and was nominated for a Tony Award for her performances in the musical Pickwick (1966) and Morning, Noon and Night (1969). Charlotte Rae made her first of many numerous appearances on television in bit parts starting in 1954. Her first recurring role on TV was that of Sylvia Schnauser on Car 54, Where Are You? (1961) which filmed on location in New York City and the Bronx. Rae's husband John Strauss co-wrote the theme song for Car 54, Where Are You? Her co-stars on Car 54, Where Are You? included Fred Gwynne, Joe E. Ross, and Nat Hiken. Below, Charlotte Rae and Don Keefer play married couple Hazel and George Atterbury in a 1961 episode of Roald Dahl's 'Way Out television series, "Death Wish". Rae convincingly plays a TV-obsessed wife. She played Aunt Charlotte on 2 episodes of The Paul Lynde Show (1972) sitcom with her old friend from Northwestern University. Charlotte Rae filmed the made-for-television movie Queen of the Stardust Ballroom (1975) with co-stars Maureen Stapleton and Charles Durning. Rae was nominated for An Emmy Award for her performance in Queen of the Stardust Ballroom. "You have to learn acceptance about things. Otherwise, you’re really destroying yourself...We spent holidays together. Then when he had a partner, Lionel, I’d invite them for Thanksgiving...I never remarried, but I had many wonderful friends. I’ve always had wonderful friends and a couple of lovely, loving relationships that didn’t lead to marriage." Charlotte Rae's ex-husband John Strauss was a nonagenarian senior citizen when he died of Parkinson's Disease in 2011 at age 90. Below, Charlotte Rae and friend in at the Emmy Awards in 1988. In 1982, while both series were on the air, Rae had a pacemaker implanted to regulate her heart. That same year Charlotte Rae was nominated for a Primetime Emmy Award as Lead Actress in a Comedy Series for her performances in The Facts of Life. When Charlotte left The Facts of Life after the 1985-86 season, her character was replaced by the new character of Edna Garrett's sister, Beverly Ann Stickle, played by Rae's longtime friend Cloris Leachman. Future film star George Clooney appeared on The Facts of Life with Charlotte Rae circa 1985-1986. 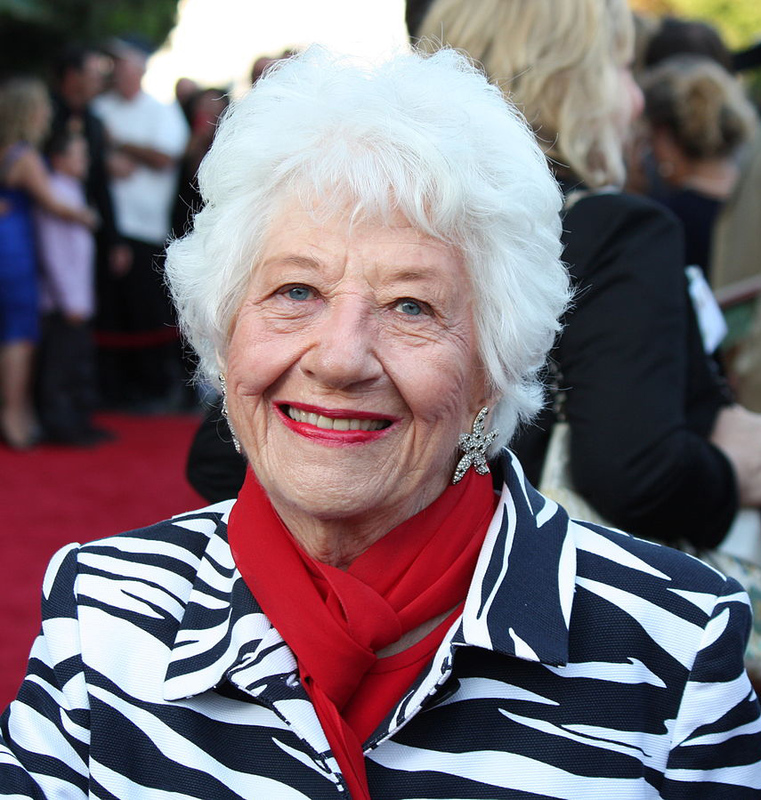 Charlotte Rae also appeared in the made-for-TV movies The Facts of Life Goes to Paris (1982), and when she was a senior citizen, in The Facts of Life Reunion (2001). Rae is still friends with her The Facts of Life co-stars - actresses Nancy McKeon and Lisa Whelchel who are now in their 50+ years, and younger actresses Kim Fields and Mindy Cohn (now in their 45+ years). Octogenarian senior citizen Charlotte Rae made an appearance at The Facts of Life 35th Anniversary reunion in 2014. 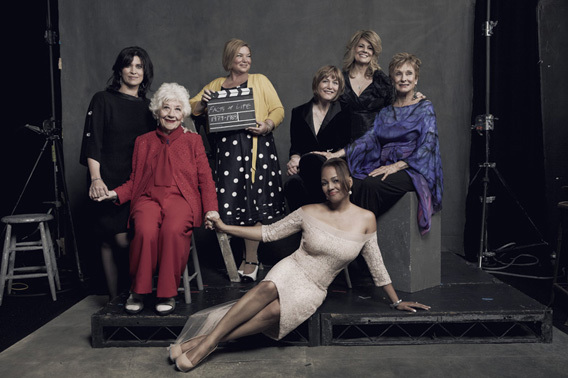 Below, Rae (second from left) and former cast members, from left the now grown-up Nancy McKeon, Mindy Cohn, Geri Jewel, Lisa Whelchel, Rae's longtime friend Cloris Leachman, and Kim Fields in front. 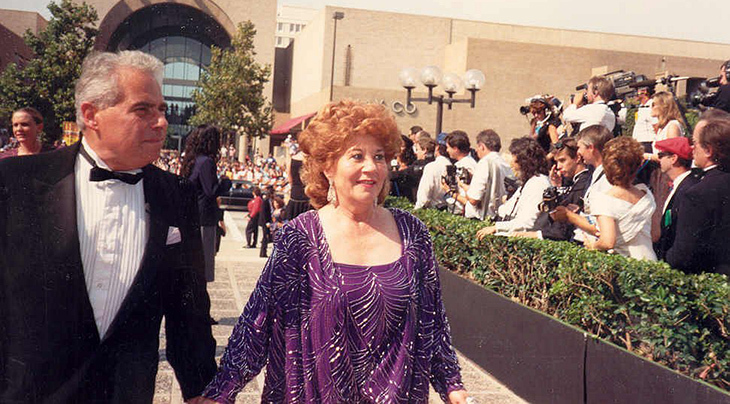 Charlotte Rae continued acting throughout her septuagenarian and octogenarian senior citizen years in the 1990's and 2000's, despite being diagnosed with pancreatic cancer in 2009. Frequent screening due to her family history of pancreatic cancer caught the disease very early and it was successfully treated; she is now cancer-free. Charlotte Rae can be seen onscreen most recently as "Oma" in the feature film Ricki and the Flash (2015) starring baby boomer favourite actress Meryl Streep and 80's heartthrob Rick Springfield. Happy 90th Birthday, Charlotte Rae! Memorial Service Music - In The Arms Of The Angel?